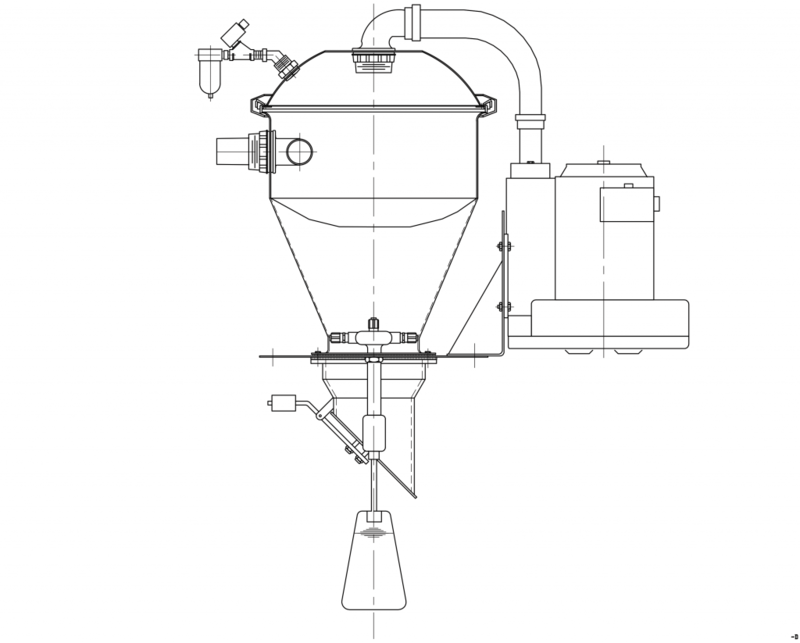 Self-Contained Vacuum Loaders – C Series – Foremost Machine Builders, Inc.
Foremost centrifugal blowers offer inexpensive, low, maintenance alternative to positive displacement pump type vacuum loading system. Available in 1.3 and 2.0 HP Models. For those who want the flexibility and convenience of individual self-contained hopper loaders, but can’t afford the maintenance problems they often present, Foremost’s C-Series loaders are the answer. Their rugged design stands up to 3-shift 24 hours a day, 7 days a week operation. And, they are offered in two horsepower ratings meeting the majority of press-side and moderate-distance resin loading requirements. By using a centrifugal blower driven by a 3-phase brushless motor, instead of the usual 110V brush type, the major cause of breakdowns and maintenance headaches has been eliminated. Pellets are conveyed, press side, at up to 1,400 pounds per hour and regrinds are also readily handled. Filter cleaning is accomplished automatically compressed air. After each loading cycle, and interval on timer initiates and energizes the filter cleaning solenoid valve to clean the chamber filter. The special flat filter (available in either nylon or felt) readily clamps in place between the chamber lid and body. Two material, ratio loading is offered optionally as models CP-13A-6C or CP-20A-6C using Foremost’s exclusive patented I.F.T. (Internal Flap-Type) proportioning system. All units are supplied with a 0.6 cubic foot spun aluminum chamber with a clamp on lid, and come with 110 Volt controls mounted in a convenient remote-mountable enclosure. A level sensor controls the automatic operation of the loader, assuring a full bin or hopper at all times. An adjustable material pick-up “suction lance”, 10 ft of vinyl flexible conveying tubing and hose clamps are included with each loader.